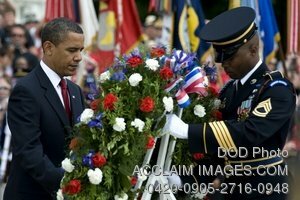 Description: President Barack Obama lays a wreath at the Tomb of the Unknown Soldier during Memorial Day commemorations at Arlington National Cemetery, Arlington, Va., May 25, 2009. (DoD photo by Mass Communication Specialist 1st Class Chad J. McNeeley). Stock photography by Department of Defense Public Domain.